Heading out for a winter adventure in your camper can be very exciting! However, trying to stay warm during winter camping can also be a challenge. Freezing temperatures can detract from an otherwise great trip. You don’t have to shell out for a fancy motorhome to stay toasty in the cold. There are plenty of ways—more than than you might think—to heat up your camper. These can range from modifications to the camper itself to useful products and accessories. There are options to suit different budgets, trailers, and people. Read on to discover tips and techniques to keep your camper warm this winter. Before you get started on modifying your camper for winter, take a moment to check it thoroughly. It’s important to make sure your trailer is in tip-top shape before you make changes. Minor problems can become major issues in harsh temperatures. It is also unwise to begin adding things like insulation over pre-existing problems. For example, you’ll want to fix any holes in the roof or cracks in the floor beforehand. Check your camper for water damage and delamination; humidity can be a problem in the winter months too. Don’t allow water damage to get worse by waiting until spring to take action. Delamination—cracks in the protective outer layer of your camper—can be serious. It could also exacerbate water damage and cause further problems. The earlier you catch it, the less costly it will be. There are also other issues that can make it difficult to keep your camper warm. If you have loose windows, or your door doesn’t close correctly, cold air will get in. Take time to make sure everything is sealed tightly before beginning winter preparations. One of the advantages of camper trailers is that they are lightweight and compact. The disadvantage to this is that they typically have thin walls. The more thorough you are with insulation, the warmer your camper will be. Insulation can go a long way toward raising the temperature in your camper. Any parts of your camper that you can access without damage should be insulated. If you are uncomfortable installing insulation on your own, go to a professional. Not every camper owner is a DIY expert! Spray foam is a cheap and simple option for insulating your camper. You can apply it to hollow spaces in the walls or floor. Foil is an excellent way to regulate temperatures; there’s a reason we use aluminum foil to keep food hot. As a bonus, foil-based insulation is effective against cold as well as heat. This means your camper will be protected from extreme temperatures year-round. You can purchase basic blanket-type foil insulation that is easy to install. Other foil insulation comes with added benefits, such as resistance to humidity and pests. Keeping your pipes and water tanks warm is mandatory. Cracked tanks can spoil your trip and are expensive to replace. It is also difficult to stay warm if you are washing with ice-cold water. Preventing pipes from freezing will save you hassles out in the cold. Get a heating cable for your pipes to prevent blockages. You can also buy heating pads for elbow pipes. As for your tanks, you can use a heating blanket to make sure they don’t freeze. Always ensure that the product you buy is large (or small) enough for your tanks. Insulation will not be as effective if your camper’s underbelly is exposed. Chilly winds blowing underneath the camper can result in a temperature drop inside. You can go all-out and insulate the underbelly of your camper. If you choose to go the DIY route, be aware of the effort involved. You may have to use multiple products (e.g. spray foam and foil) to be sure the whole underbelly is protected. If insulating your camper’s underbelly isn’t for you, not to worry. You can get a skirt for your RV, to keep bitter winds from circulating underneath your trailer. As with insulation, skirting comes in a range of materials, including weather-resistant material, foam boarding or plywood. Some types are permanent fixtures, whereas others can be packed away after use. You can have a custom-made skirt fitted to your camper by a professional company. However, this option tends to be pricier than buying your preferred material and doing it yourself. Check out how to skirt your RV with foam insulation boards on video above. Your camper windows can be responsible for a lot of heat loss. There are options for every budget to get your windows winter-ready. If you’re looking to upgrade your camper, replacing your windows is a great way to go. As the name suggests, dual pane windows have two layers of glass for extra insulation. Replacing your camper’s windows is best done through a company specialized in RV glass. Don’t go for the cheapest option when it comes to dual pane glass. Poor quality windows can be as ineffective against the cold as single-pane glass. If you don’t have the budget for dual pane glass, try window coverings. 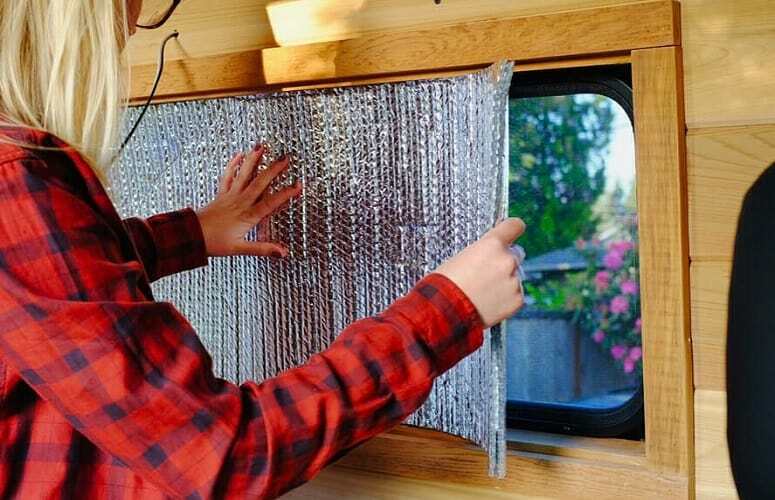 There are a wide variety of options for blocking out your camper’s windows to preserve heat. Shrink wrap insulation kits are inexpensive and easily installed. If you don’t mind blocking your view for the night, put up foil insulation panels. Foam seal tape can also be applied around your windows to prevent drafts. You can even insulate the windows of your trailer’s door. Use an insulator that has hooks, to set up and remove without hassle. Uncovered vents can ruin all your insulation efforts. Making use of vent covers can significantly reduce heat loss. Cover your vents externally with a standard roof vent cover. 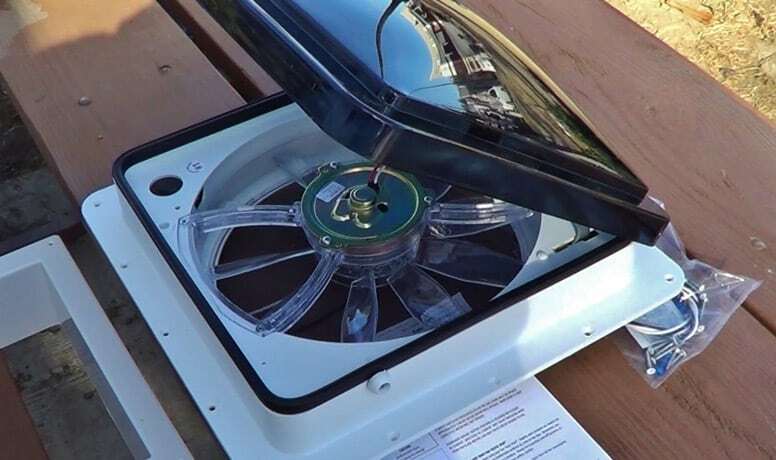 This will reduce the amount of cold air that gets in, and prevent snow and rain entering your camper. As for internal protection for your vents, make sure they are insulated. An insulating foam vent cover can be neatly fitted into most standard-sized vents. When you need to use your vents again, just pop it out. If you have non-standard sized vents, you can make your own vent cover. Use your insulation material of choice and cut it to fit your vent. Note that covering your vents means things can get humid. This is particularly true if the rest of your camper is sealed up tight against the cold. As we all know, moisture is not good for your camper in the long term. 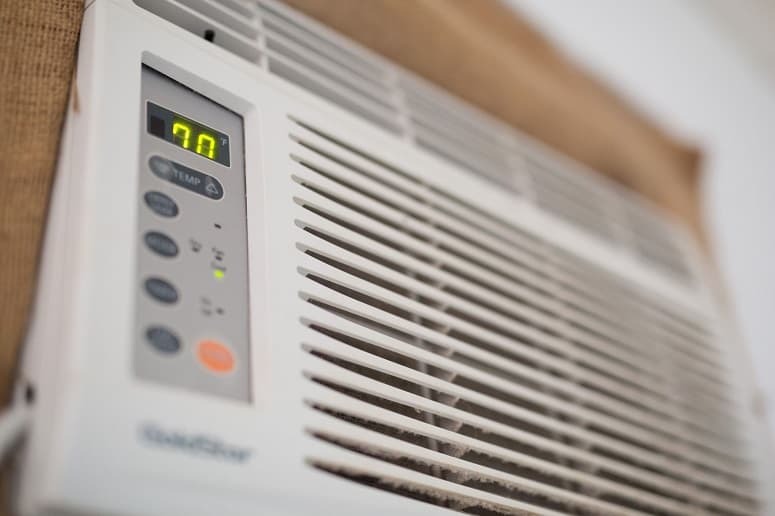 Combat the humidity with a dehumidifier. These handy gadgets will stop condensation from building up on your windows, reducing the risk of mold and mildew. Since most campers are not large, small and portable is the way to go. Consider how much noise you can tolerate, as some dehumidifiers can be loud. Don’t be afraid to use heaters. 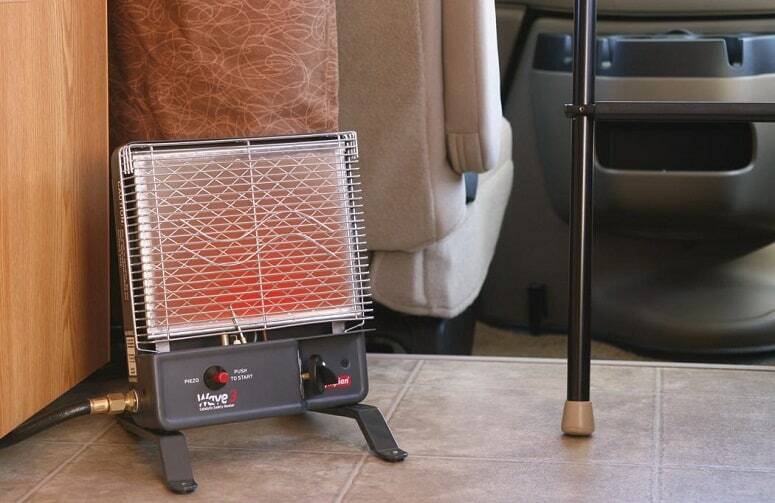 A good heater can make a big difference to the temperature inside your camper. You can find safe, RV-appropriate heaters of all types. Safety is the primary concern when it comes to putting a heater in your camper. Small spaces and hot appliances can be a dangerous mix. Knocking over a heater can result in you (or your belongings) getting burned. Or even worse, you could end up with a fire. If you choose a propane heater, get one that has failsafe mechanisms in place. This heater, for example, will shut itself off if oxygen levels get too low. If anyone tips it over, it will turn off automatically. If you prefer an electric heater, look for the same quality in terms of safety. This portable space heater stays cool to the touch while working to avoid burns. It also has a function to avoid overheating in case you leave it on for too long. If you’re looking for something more luxurious, there are high-end heaters available. The Lasko ceramic space heater allows you to select the exact temperature you want, and comes with a remote control. If your goal is to keep warm, Insulating yourself is just as important as insulating your camper. The right cold-weather accessories will be a big help. The wrong blanket can lead to chilly nights, despite your best efforts. Think about getting a plush, microfiber blanket for warm nights in your camper. The material is breathable, which means you don’t have to worry about overheating. If you want something with a little extra heat, buy an electric blanket. This model is non-hazardous and will automatically shut off after 10 hours. When you are packing, don’t neglect to bring along warm, comfortable indoor clothing. Choose heavy pajamas, thermal leggings, and warm sweaters. Don’t forget to keep your feet warm! Insulated socks will keep your toes from freezing inside and out of your camper. It’s worthwhile to cover your floor with carpets, at least for the winter. Even in socks, a bare floor in your camper can be shockingly cold. A carpet will also add an additional layer of insulation. If you find something that you like but it’s too big, you can always cut it down. Particularly in the winter, researching your destination is a necessary precaution. Your favorite place in the summer can be a drastically different environment in the winter. 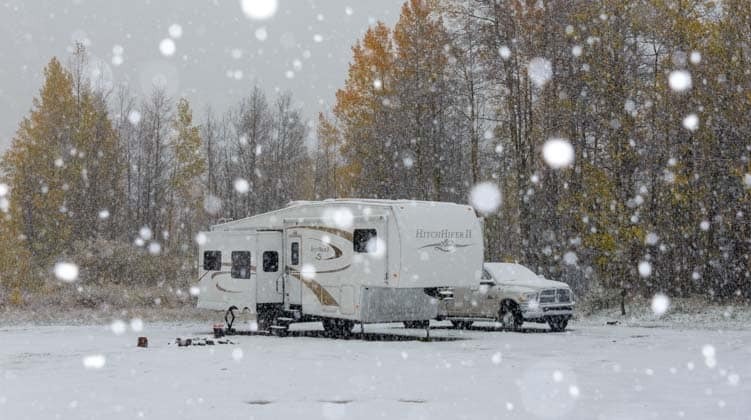 You need to get an idea what the weather conditions are like before bringing your camper out. Enjoying the winter weather is fine, but getting stuck in a blizzard is not. Once you reach the campsite, monitor the area before setting up your camper. Park your camper where it will not be shielded from the sunlight. Direct exposure to the sun can heat your camper up during the day. Even if the sun makes infrequent appearances, every little bit can help. If possible, try to shield your camper from strong, icy winds. This is usually an issue at high altitudes. 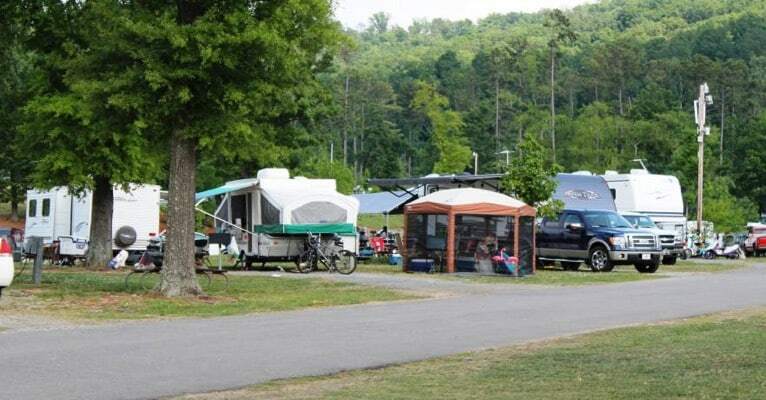 Find a sheltered place to set up where your camper will be least affected. Your camper’s oven is a great source of heat! Unlike during the summer, using your oven in the winter is something to look forward to. After a long day of outdoor activities, why not prepare a hearty meal? Using your oven will generate heat, particularly for meals that take time to cook. As an added bonus, your camper will also be infused with the smell of whatever is cooking. You might want to avoid onion-heavy dishes—try cookies or casseroles instead. Leave your oven door open for a while after you are done cooking. The remaining heat will dissipate into your camper. Be extremely careful of doing this if you have children or pets with you. Now you know all the ways you can heat up your camper. I’m sure it’s a relief to know there are other strategies besides buying a new furnace. Camping in the winter can be a wonderful experience. But being uncomfortably cold in your camper the whole time could put you off winter camping permanently. With preparation and a few investments, you can enjoy your trip in comfort. Staying warm and dry is definitely achievable in a camper. Did this article give you ideas for heating your camper? Do you have other techniques to heat up a camper? Share this article with fellow camper owners who love winter camping!